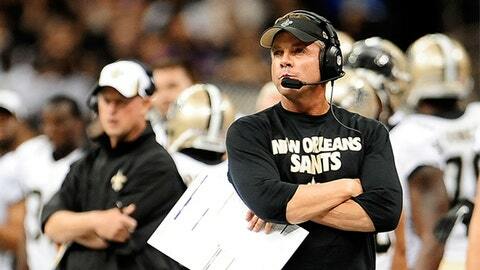 Sean Payton needs to find some answers as his Saints face the Panthers in the FOX Game of the Week. Who Dat wearing our uniforms on the road? It certainly can’t be the Saints, at least not the Saints people see in the Superdome. They look like Super Bowl contenders at home. They turn into the Texans on the road. The malfunction has reduced Payton to handing out pink slips and spouting non-sequiturs. OK. We know their bodies will be in Charlotte Sunday for FOX’s Game of the Week. Payton can only hope their minds are no longer in Seattle or New York or one of the other locales that have gotten the Saints into this fix. Two weeks ago, New Orleans clobbered Carolina 33-13 in the Superdome. The NFC South seemed locked up. And then the Saints caught a plane to St. Louis. The 27-17 loss thrust the Panthers back into the division race. Win Sunday, and all they’ll have to do is beat Atlanta the next week to clinch the title. If the Saints win, they’ll claim the NFC South because they hold the tie-breaker advantage. More importantly, it would keep them off the road through the first round or two of the playoffs. The last thing New Orleans wants is a wild-card ride to the Super Bowl. The Saints are 0-3 in road playoff games under Payton, but they’ve usually been a good regular-season road team. That’s changed since Payton’s return from last year’s Bountygate suspension, and it’s hard to figure out why. New Orleans is 3-4 away from home and trending downward. It doesn’t just lose, it usually stinks up the road joint. In their past four road games, the Saints lost to Geno Smith’s Jets, 26-20, barely beat the woeful Falcons, 17-13, were demolished by Seattle, 34-7, then fell behind 27-3 to the piddling Rams. That game featured two interceptions, a fumble, an onside kick that wasn’t recovered, two missed field goals, seven penalties and four sacks. In other words, the Saints didn’t show up. Or maybe they did. The Saints are averaging 32.9 points at home and 18.4 on the road. Maybe they suffer some sort of dissociative identity disorder and have two personalities — Superdome and Stupordome. It’s as good a theory as most that have been advanced. The most popular one is the Saints can’t perform without a roof over their heads. But the last time anyone checked, the Georgia and Edward Jones domes weren’t called domes for nothing. Weather and noise might have been problems in Seattle. They weren’t in St. Louis, Atlanta and New York. Payton made that clear this week. “There are probably going to be some changes made around here, and some of you won’t like it,” he told players Monday. Charles Brown probably didn’t. The left tackle was benched after giving up two sacks against the Rams. He’s been replaced by rookie Terron Armstead. Expect the Panthers to test out that move with a few blitzes on Sunday. The Saints also released longtime kicker Garrett Hartley. Firing your kicker and starting left tackle 14 games into the season is not a tactic Super Bowl contenders have historically employed. Well, not any of them. Brees probably won’t be getting benched for Luke McCown, especially against a team like Carolina that has won nine of its past 10 games. Maybe that’s the answer Payton is looking for. Visualize success. Or better yet, visualize that every game is in New Orleans. If they don’t start playing that way, it’s hard to see anything but trouble for the Saints.